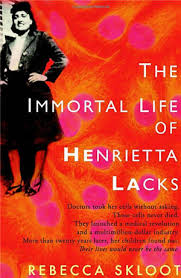 From the very start there was something eerie about the cancer cells on Henrietta Lacks’s cervix. Even before killing Lacks in 1951, they took on a life of their own. Removed during a biopsy and cultured without her permission, the HeLa cells (named from the first two letters of her first and last names) reproduced exuberantly in a lab at Johns Hopkins — the first human cells ever to do so. HeLa became an instant biological superstar, traveling to research labs all over the world. Meanwhile Lacks, a vibrant 31-year-old African-American who had once been a tobacco farmer, tended her five children and endured scarring radiation treatments in the hospital’s “colored” quarter.